“Argh! For the love of God, please stop!” As the scream echoes through my emergency department (ED), I snap around so fast; one day it will give me whiplash. My suspect list is short. “Who is being seen by a surgical consultant?” In room 3b, the intern is making an incision for a chest tube while the surgery resident watches thoughtfully. “Give her some more lido,” he mutters, startled by my entrance. I stretch a believable smile. Surgical residents have substantial egos necessary to build confidence and elevate them through years of stress, hard work, and sacrifice. Like hydrogen blimps, a similarly important part of early aviation, the egos can grow very large but explode when mistreated. I am quietly enraged at the torture before me. “May I assist with anesthesia?” I gently ask. The intern looks up apologetically. “The nurses can't spare someone for conscious sedation for another 20 minutes. We got OR in 10.” Eureka. 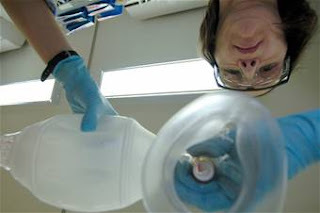 To protect patients and prevent liability and bad press when a patient dies from mishandled sedation, the hospital protocols and The Joint Commission demand that a nurse accompany the patient for the entire time when they are sedated and narcotized. There is also awkward paperwork that complicates the process. The intent of the protocol is to make procedural pain control safer. Its result is ubiquitous suffering of patients whose procedures may hurt as much as they did 200 years ago (before ether). In busy environments such as the ED, dedicating a nurse to one patient for 30 minutes is challenging and leaves other patients “uncovered.” Time-crunched specialists prefer not to wait for nursing to mobilize and are often unwilling to endure paperwork and hassle. Trying to “wing it” using lidocaine injection alone, a rushed resident impatiently starts the procedure even before waiting the 2 to 3 minutes necessary for the full local anesthetic effect. It uses up ED attending time, but for all the right reasons. I start with half the intended final dose for the rare hyperresponder. There is naloxone in my pocket and I've never had to use it. I am ready to intubate should the need arise, but I doubt it will. I memorized side effects of fentanyl and consider risk-benefit beforehand. And yes, I think it is an adequate approach to procedural pain for most ED interventions on typical adult patients, especially when local anesthetics are appropriately used. Conscientiously, I titrate to smile.